Milk Bar Soho Closed Over the WeekendIt became a casualty of the closing of Band of Outsiders. Baby, It’s Cold: 12 Advanced Hot Chocolates You Should Drink TodaySpiked with lavender, caramel, brownie batter, and booze. Christina Tosi Will Hand Out Free Momofuku-fied Cereal This Week in MidtownThe Roots and Tony the Tiger will also make appearances. Aldea Hosts Portuguese Chefs; Lucky Peach’s Soft Serve ShindigToday’s Leftovers. Christina Tosi Releases 5 New Soft-Serve Flavors at Momofuku Milk BarYuzu and verbena debuts in midtown. Aska’s Wine Series; China Blue’s LUCKYRICE EventPlus: Milk Bar’s new class, and more, in today’s Leftovers. Momofuku Milk Bar Unveils Limited-Edition ‘Cinnamon and Lesbians’This day can in fact get colder. Christina Tosi Is Giving Away Free Cookies Right NowChandon icing, Chandon sprinkles. Turkey Time: 15 Shops Serving Thanksgiving-Inspired SandwichesBecause holiday food tastes better between bread. Stick It: Seven Great Foods Served on a SkewerEverything tastes better on a kebab. GoogaMooga’s Third Day Canceled; Vendors Need Your Help [Updated]Here’s how to support the vendors who were sent home. 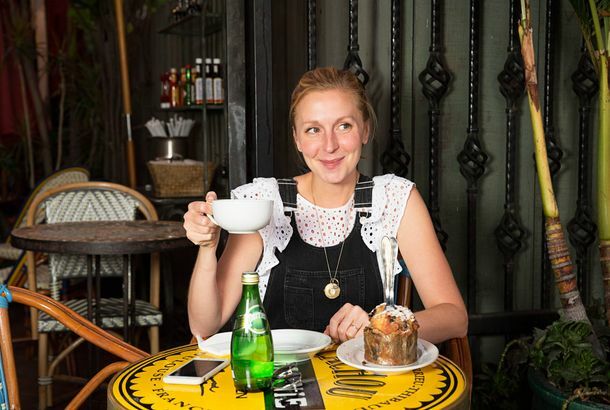 Momofuku’s Christina Tosi Writing ‘Milk Bar Life’The pastry chef delves more into the savory side in her new book. Great GoogaMooga 2013 Lineup Includes Pok Pok, Milk Bar, Roberta’s, andThe second time’s a charm. Christina Tosi and Karlie Kloss Will Deliver Free Cookies Tomorrow; ZuckerPlus: Chefs Chris Jaeckle and Dale Talde team up for a dinner, and more, in today’s Leftovers. Slideshow: See Christina Tosi and Other Top Pastry Chefs at the TrenchermenPastry chefs turn out for Killing Me Sweetly. Leslie Mann Cuts the Line at Momofuku Milk Bar; Macaulay Culkin Spotted at TacoPlus, Amanda Seyfried picks up the check at Beatrice Inn, Billy Joel lunches at Circo, and more of this week’s celebrity dining news. Momofuku Milk Bar Truck Will Dispense Thousands of Free CookiesHow sweet it is. The Stollen Renaissance: New Takes on the Fruit-Studded, Sugar-Dusted ChristmasIf you think that they’re all the same, think again. Oren’s Seeks Fortune in FiDi; La Maison Cointreau Is Basically What ItIf you like piña coladas, don’t go to La Maison Cointreau. Christina Tosi Finds Cookie Inspiration in All the Wrong PlacesA molten sea of gummy bears. Momofuku Milk Bar Coming to Montauk; Aldea Celebrating Portugal DayPlus: Polenta-palooza in Williamsburg, Brother Jimmy’s BBQ in Long Island grocery stores, and more of today’s leftovers. Eataly Hosts Guest Pizzerias; Grilled Cheese Competition Pops Up in SohoPlus: Sixties prices at Big Nick’s Burger Joint, a wine-pairing event at Kingswood, and more neighborhood news. Alice Waters Doesn’t Like the Momofuku Milk Bar Book, and Won’t“Crack pie” pretty much horrifies her. Momofuku Milk Bar Pastry Chef Landing in Palms Next WeekChristina Tosi will sign books at Chego and probably sling something sweet this way, too. Christina Tosi Has an Interesting Name for Menial WorkA rhyming phrase, involving ladies’ anatomy. Mastering the Art: How Cookbooks Are Pushing the Publishing Industry ForwardAs e-readers overtake print, it’s cookbooks, of all things, that are making sure bound books aren’t going anywhere.